This is a great way to let everyone customize their pie. We recently had the “Biggest Loser” Run/Walk come to Panama City Beach to launch their national campaign. Because of my contributions to Julie Hadden’s book, I was interviewed about healthy recipes. You can read the article here. Julie was the runner up for season 4 of the Biggest Loser and she wasn’t as fond of cooking as I am. When I first had her family over for dinner, we made grilled pizza and her son, Noah, absolutely loved it. Julie ended up re-making the recipe with a pre-made crust option, and it became a family favorite. Julie and I made these in Jacksonville when a local station there did Biggest Loser campaign. Preheat oven to 400ºF. Separate the top from the bottom of the pita to create two equal circles. Place both circles on a baking sheet sprayed with non-stick baking spray (smooth side down). Combine the tomato sauce, siracha, and sugar for a spicy sweet sauce. Spread this on your pitas then top with the Italian cheese blend and pepperoni. 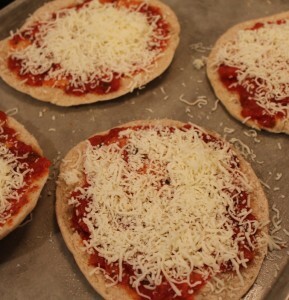 Place in oven and bake for about ten minutes until cheese is melted and crust is toasted. Top with fresh basil and chili pepper if desired. This recipe is featured in Fat Chance by Julie Hadden Published by Guideposts 2009.